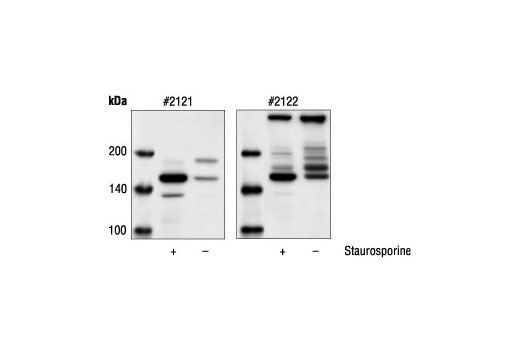 Western blot analysis of extracts from HeLa cells, untreated or staurosporine-treated, using Cleaved alpha-Fodrin (Asp1185) Antibody (left) or alpha-Fodrin Antibody #2122 (right). Cleaved alpha-Fodrin (Asp1185) Antibody detects endogenous levels of the large fragment of alpha-fodrin resulting from cleavage at aspartic acid 1185. The antibody does not recognize full length alpha-fodrin. Polyclonal antibodies are produced by immunizing animals with a synthetic peptide corresponding to amino-terminal residues surrounding Asp1185 in human alpha-fodrin. Antibodies are purified by protein A and peptide affinity chromatography. Fodrin (also named nonerythroid spectrin) is a universally expressed membrane-associated cytoskeletal protein consisting of alpha- and beta-subunits (1). This protein is important for maintaining normal membrane structure and supporting cell surface protein function (1). Alpha-fodrin is one of the primary targets cleaved by caspases during apoptosis. The full length 240 kDa protein can be cleaved at several sites within its sequence by activated caspases to yield amino-terminal 150 kDa, carboxy-terminal 120 kDa and 35 kDa major products (2-5). Cleavage of alpha-fodrin leads to membrane malfunction and cell shrinkage. Bennett, V. and Gilligan, D.M. (1993) Annu. Rev. Cell Biol. 9, 27-66. Vanags, D. M. et al. (1996) J. Biol. Chem. 271, 31075-31085. Cryns, V. L. et al. (1996) J. Biol. Chem. 271, 31277-31282. Wang, K. K. et al. (1998) J. Biol. Chem. 273, 22490-22497. Janicke, R. U. et al. (1998) J. Biol. Chem. 273, 15540-15545.